Plot When a cheery hospitality industry graduate, training at a Delhi hotel, crosses path with a level-headed, career-oriented colleague, they strike up a usual friendship, until an incident brings them together, forging a bond between them that goes beyond the usual. Life takes an unexpected turn for both of them and nothing seems to be like it was before. They say content is king and any story can rise above the ordinary if the content in it is strong enough. 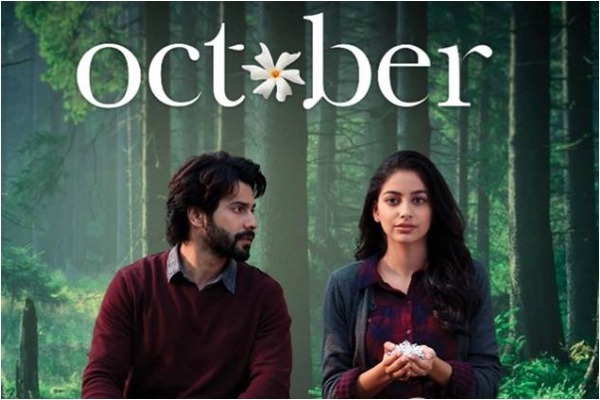 Such is the case with Shoojit Sircar’s just released ‘October’, which is delightfully written by Juhi Chaturvedi, who needs to be showered with all the praises for giving us a story that we can cherish for a very long time. Love can be found in the strangest of circumstances and that is exactly what is depicted in ‘October’, which stars Varun Dhawan in the lead, alongside newbie Banita Sandhu. The film is about a 21-year-old Danish Walia aka Dan (Varun Dhawan), a hotel management graduate, who is interning in a plush Delhi hotel, along with some of his friends, which also includes Shiuli Iyer (Banita Sandhu), a bright, young Tamil girl, with a very special Bengali name. Dan is a typical young guy; he is goofy; he is annoying; he is street smart; he is short-tempered and he is affectionate. And that makes him one of the most popular guys in his group. While Shiuli is serious about making a career in the hospitality industry, Dan is displeased with the odd working hours and the constant disrespect he faces from the hotel guests. While Dan and Shiuli never acknowledge their love for each other, it seems they secretly harbor feelings for each other despite all their odds. The only times they come face-to-face with one another is during awkward conversations or casual work talks. But when it’s time to really speak what their heart desires, their lives hit a roadblock. Shiuli tumbles down the third floor and is hospitalized in a comatose state. Dan, who wasn’t there for his colleague when she would have needed him, now feels an emotional connection with the girl, while she lay in her hospital bed, motionless and probably emotionless. Then on begins Dan’s journey, who finds love in the strangest of circumstances and in the most unusual ways one can think of. ‘October’ is one of the most finely made films about love. The tagline says “It is not a love story; it is a story about love” and the writer and director make sure they stick to the tagline, without veering away from the topic. Sircar has previously entertained us with heartwarming stories – ‘Vicky Donor’ and ‘Piku’ – and his ‘October’ falls in the same category, with the bar raised a few levels above. The film is life-like and youngsters can definitely identify themselves with Dhawan’s character, which he has played with utmost sincerity. Varun Dhawan is the heart of the film and newcomer Banita Sandhu is the soul. Like his previous outings, Dhawan doesn’t go overboard with his acting and gives a restrained performance. We have seen him as the boisterous young man in many of his movies before, and it is a treat to watch him play a man learning to grow up due to the situations he is caught in and we must say, he delivers well. Banita Sandhu doesn’t come across as a debutante. She lets her eyes convey her feelings and her expressions speak volumes about her sheer talent. Banita is a breath of fresh air! A special mention goes to Gitanjali Rao, whose debut acting performance is nothing short of amazing. Although the film isn’t shot in many locations, the confines of the hospital room, the hotel and the familiar places of New Delhi are captured well by cinematographer Avik Mukhopadhyay. He transports us into a different world altogether. The dialogues are laced with humour and don’t seem forced. Songs do not mar the pace of the already slow film and that is a plus. Sircar and Chaturvedi need pats on their backs for bringing out a breezy story about love, which tugs at your heartstrings and cheers you up too. All in all, ‘October’ is a compelling watch. And if you are wondering what October means in the title of the film, you must watch it now!